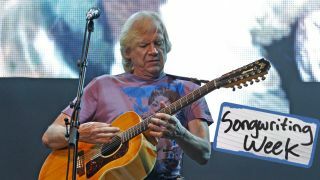 "You have to develop your own style"
SONGWRITING WEEK Justin Hayward joined The Moody Blues in 1966 at a time when the band were losing their direction. Lead singer/songwriter Denny Laine was out and with him the rhythm 'n' blues sound that had brought them initial success. Hayward's progressive track Fly Me High reinvigorated the group and put them on a path of reinvention that would help deliver iconic hits like Nights In White Satin and Question, plus a casual 70 million album sales. What are the most important songs in your career? "Nights In White Satin was big, but it took a long time. It was a slow-burner and then it hung around forever. But Question was instant - we did the Isle Of Wight festival off the back of a number one record. It really turned things around, particularly in America where it elevated us into a stadium rock thing. "There are two other songs that are particularly important to me - one is called Your Wildest Dreams and another is called I Know You're Out There Somewhere. They were in the 80s and they put us in the charts in the US with top 20 records - it was like a second go around when we were 40. It was the happiest the group had ever been." Has the way you view Nights In White Satin changed over the years? "It's funny, I was just a kid when I sat on the side of the bed and wrote the basics of that song. I was only just 20 years old. Then two years ago someone sent me an MP3 file of a woman called Bettye Lavette and she'd done a version of Nights... I listened to her version and I burst into tears! "I wrote it when I was 20, but I heard it for the first time when I was 64 years old. I heard the real meaning of it. Not that I'd been doing it parrot fashion, but I did it with a 20 year-old's problems for the last 40 years. She took every word, every line and made it about her own life." "I was lucky enough to get a job playing guitar with Marty Wilde - a big rock 'n' roll singer in the late 50s and 60s. He told me that to survive in the biz you have to develop your own style and that the best way to do that was to write your own songs." How did joining The Moody Blues affect your writing? "The Moody Blues gave me the vehicle and the inspiration. The Moody Blues were the performer for me, the writer, and that was wonderful. The original group had been together for such a short time. Denny [Laine] was the voice of that rhythm and blues stuff and he kind of took that spirit with him - and the others weren't comfortable with that - but there was no idea or plan to change. Then after about six months we all just threw our hands in the air and just said, 'OK, let's just all write and do our own material and forget the blue suits' - which we were crap at." How long did it take you to write something that you couldn't wait to play to people? "There was one song in The Moody Blues that as soon I joined the band everyone went for and that was the turning point. It was a song called Fly Me High. Eventually we got to record it at Decca with Gus Dudgeon engineering and that was the first time we met Tony Clarke, who became The Moody Blues' producer. That was the one where we knew as a group that something was going to happen. It was the first song where I remember thinking, 'Now that's right.'" Do you have a writing routine or ritual? A particular instrument, for instance? "It usually all starts with guitar for me because I'm in love with some particular guitars that I've had for years. I've got a Martin 1955 D28 that I bought in the 60s and that is absolutely gorgeous. And then my red Gibson ES-335 turns up. That's the favourite. It's guaranteed that you will pick it up and it will be faithful and in tune and just sound right." Is location important to your writing? "Only in so much as I've found a lot of places where I couldn't write, which is odd. But then the oddest thing is where I can. I can write in a broom cupboard, but I can't build a house with everything that a writer would need and expect it to work. I tried that once and it didn't work at all - I never wrote a thing there. But a little corner of a dark place and it's like, 'Oh, this is good.'" "It would have to start off with those faceless people who wrote for Johnnie Ray and The Platters. Then it came into focus for me with Buddy Holly and I realised what the way forward was. He could set a song up quickly and the movement of the chords, even though there were only three or four, would capture you. Then I was lucky enough to be on the London swinging 60s scene when The Beatles came on to it and it was like '[Here are] our acknowledged leaders.'" What lessons have you've learned about songwriting? "Songwriting is a magical thing. It's a world of imagination and we're very lucky to be part of it and be in this business where we live, talk, think and eat and drink and sleep music. It's fantastic, really."